This rare Whiskey Towers hotel condo offers a retreat for small family of 4 or a traveling duo comfortably with 2 Queen beds. 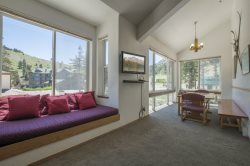 The view from this 6th story room is one of the most desirable in the entire Kirkwood valley. Easily ski in to the buildings entrance to grab lunch in the condo or take advantage of the 7800’ Bar & Grill at the base of Whiskey Towers. A mini fridge and microwave have been provided for convenient quick meals and snacks. Stay connected while on vacation with the wifi provided in this condo. - Bedroom - 2 Queen Beds. It was great! Clean and well maintained! The room was easy to check into, clean, safe, and ideal for the weekend. We had a great time, thanks. This was our first time being there.